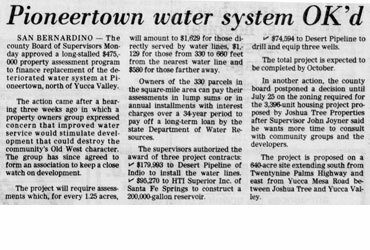 SAN BERNARDINO – Concerned that there may not be an adequate source of supply, county supervisors Monday postpone action for at least a month on a proposal to start design of a new water system for Pioneertown, near Yucca Valley. 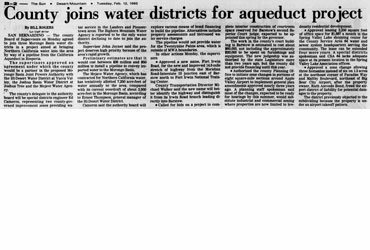 Don’t Board Chairman James Mayfield said he was afraid the Special Districts Department was “putting the cart before the horse” in recommending design of a system prior to any showing that there would be adequate water for it. As request for further consultation on the problem resulted in postponement until Jan. 14 of board action on proposals to form an improvement zone for the small desert community north of Yucca Valley and to levy fees of $75 per acre of property owners to pay for the design work and assessment processing. 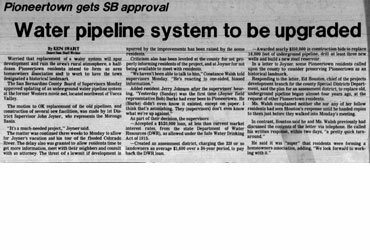 Special districts Director Albert Reid cautioned that the cost of drilling A test well would exceed that of the design work, estimated at $48,000. Ed Houston, special district engineer, conceited that the availability of underground water “is a problem.” He said the plan has been to drill a well in the wash area near the existing one serving part of the community. Houston reported that 190 of 345 property owners in the area responded to a recent poll, and 136, or 71 percent, favored the proposal to replace and expand the community presents undersized, deteriorated System.